I am loathe to be seen as a cheerleader, and rest assured I could point to many things about Visual Studio in general and VS2005 specifically that I can’t stand. But somebody out there deserves some credit for the fact that startup performance seems to have been drastically improved. In my informal test (“One Mississippi .. two Mississippi”), VS 2005 outperforms 2003’s startup by an order of magnitude. Two seconds compared to thirty seconds on the same machine. That’s certainly nothing to sneeze at. You click on the icon, it opens. All software should work this way. I’m looking directly at you, OpenOffice, Trillian, and every single product developed by Adobe. 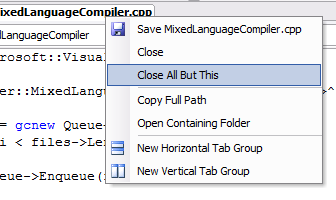 While I’m on the subject, never allowing your program to close is not an acceptable solution to this problem. Do You Work at Amazon? Dan McKinley is a Principal Engineer at Mailchimp in Los Angeles. Previously: Skyliner (RIP), Stripe, and Etsy. Feed | Copyright © 2004-2019 Dan McKinley.